Today was the day I had waited months to arrive-I finally got to meet Tom. I had a plan in my head how we would adopt him and he’d live happily ever after with Papa’s Pugs. Logically, it probably was not a real sound or realistic plan to have 5 pugs and to provide for them with the necessities of food & medications and the luxuries of clothes & fancy harnesses. Not to mention the logistically of having to feed 5 pugs in 3 different locations and the thought of travelling with that many paws is just overwhelming. 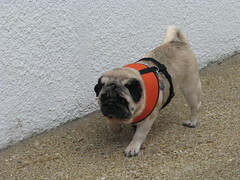 But I don’t think with my head when it comes to pugs, I think with my heart! I have really been struggling with wanting to adopt Tom and then realizing that it might not be the best for my other pugs. The struggle is no more. It was Teddy who decided that Tom was not going to be joining the family. Tom was here for all of 15 minutes when Teddy started going berserk! He was acting in his typical “Doo Doo Boy” fashion by growling at and chasing which ever pug that he does not like. Poor Tom had to hide in the corner while we ate lunch. When Teddy could not find Tom, he started chasing Baby Girl around. So it was decided that Tom would continue on to Atlanta and wait for Pugfest without Teddy chasing him around for the next 5 days. Part of me is relieved that I was not the one making the decision if Tom stayed with us or stayed in rescue-Teddy 100% took care of that! And part of me was embarrassed that Teddy acted so terribly! He just does not do well with other pugs in his house or other males, but to see how naughty he acted was a bit humiliating. It would be like your child pitching a complete temper tantrum, but you know that they are really a good kid when others aren’t around. Then a lot part of me was sad that Tom still has to wait for him forever home, but happy for him because he clearly loves his foster mom, Susan. I guess that sometimes no matter how much we want something (or think we want something); things always work out for the best. I will continue to love & care for our 4 pugs, while Tom will find his furever home who will love him and provide for him. Pug hugs go out to Tom for being so adorable! You are currently browsing the archives for the blind category.